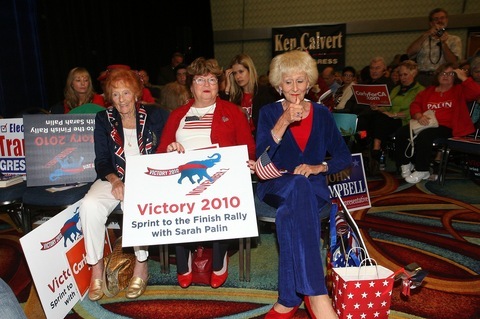 Republican supporters attend the Republican National Committee “Victory Rally with Sarah Palin” in Anaheim, Calif., on Saturday. Photo by Valerie Macon/AFP/Getty Images. If money usually follows momentum in politics, then Republicans are the ones with the wind at their backs with a little more than two weeks until Election Day. The headlines over the weekend drove that point home. “In the 10 closest Senate races and 40 most-competitive House contests, Republicans raised $60 million in the third quarter, the last public tally of fund-raising before the November elections. Democratic candidates raised $45 million, according to reports filed with the Federal Election Commission over the weekend. “Republican Senate candidates entered the final month of the campaign with at least $16 million more to spend than their Democratic opponents, according to a POLITICO review of campaign finance data in the top 20 Senate races. For those interested in just the pure numbers, The New York Times offers this nifty interactive chart that looks at third-quarter fundraising in some of the most competitive House and Senate races. Republican candidates will be able to draw not only on their own campaign funds, but many will receive an additional boost from some of the $50 million pledged last week by a coalition of GOP outside groups that includes American Crossroads, its non-profit affiliate Crossroads GPS and the American Action Network. The Louisville Courier Journal calls Sunday night’s exchange between Democrat Jack Conway and Republican Rand Paul “their most contentious and personally bitter debate” to date. The tone of the debate was not too surprising once Conway released a hard hitting negative ad going after Paul’s association with a group at Baylor University (during his time there in college) that mocked Christianity. Paul said that he would refuse to shake Conway’s hand because of his personal attack. He also questioned whether Conway had any decency or shame for launching such an ad. You can watch some of the debate here. After spending much of the 2010 cycle eyeing seats in traditional battlegrounds like Ohio, New Hampshire, Missouri and Florida, Kentucky is the only Republican held Senate seat in the country where Democrats still have a fighting chance at a pickup. It is still, however, an uphill climb for the majority party there. “Buck said after the debate that he ‘wasn’t talking about being gay as a disease’ but also said of his remark that ‘there’s no doubt there will probably be a commercial on something like that’ from Democrats,” writes Michael Riley of the Denver Post. The Democratic incumbent, Sen. Michael Bennet, called Buck’s response outside the mainstream, which has been the narrative frame his campaign has attempted to build around Buck for much of the campaign. It’s a rare sight these days to see Democrats playing offense anywhere in the country. But that is precisely what Vice President Joe Biden is doing Monday when he headlines a 5:15 p.m. EDT event in Allentown, Pa., on behalf of Bethlehem Mayor John Callahan. The vice president will attempt to put his Scranton roots to work for one of the top tier Democratic recruits of the cycle. Of course, this has proven to be a cycle where it’s no badge of honor to be a Democratic recruit, even of the top-tier variety. Rep. Charlie Dent, R-Pa., has represented Pennsylvania’s 15th congressional district since 2005. It’s one of 34 districts in the country that President Obama won, but is represented by a Republican in Congress. Mr. Obama bested Sen. John McCain here by 13 points in 2008. In a more neutral year, the incumbent Republican would have a tough fight on his hands in a district like this one. But Democrats are poised to pickup only four to six Republican seats this year — in far more heavily Democratic districts or where far more flawed Republican candidates are on the ballot.